Disclosure: I was sent copies of these books free of charge for this review. All opinions in my review are my own and I did not receive any other compensation. As in all my reviews I am providing links for your ease, but receive no compensation. is January 28th this year. We will be saying goodbye to the monkey and enter the Year of the Rooster in the Chinese Horoscope. We have had a fun year of the monkey and are looking forward to the year of the rooster. To teach Hazel more about the Chinese culture we have enjoyed two books written for the year of the rooster. Both are bilingual books. 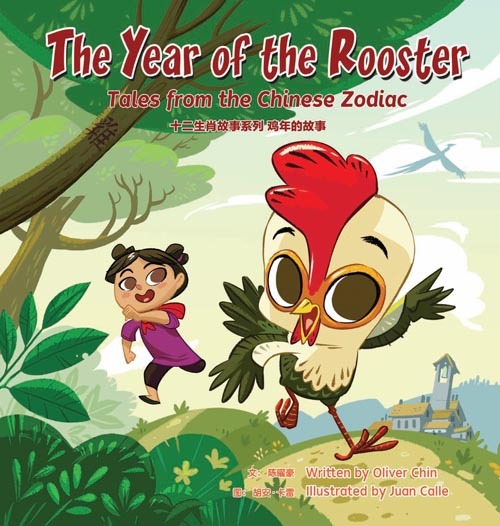 The first is called The Year of the Rooster by Oliver Chin and illustrated by Juan Calle. This book is the twelfth and final book in the Tales of the Chinese Zodiac Series. It tells the tale of a young male chick, Ray who learns a bit about his future job from his father and then goes on an adventure to find the mysterious phoenix after the pig shares a feather with Ray. His friend, Ying, goes with him on this adventure and they meet all of the other animals of the horoscope and each gives a clue as to where the phoenix is. The phoenix tells Ray and Ying that they have a fiery spirit and a bright future ahead. These of course are part of the zodiac personalities of people born during the year of the rooster. 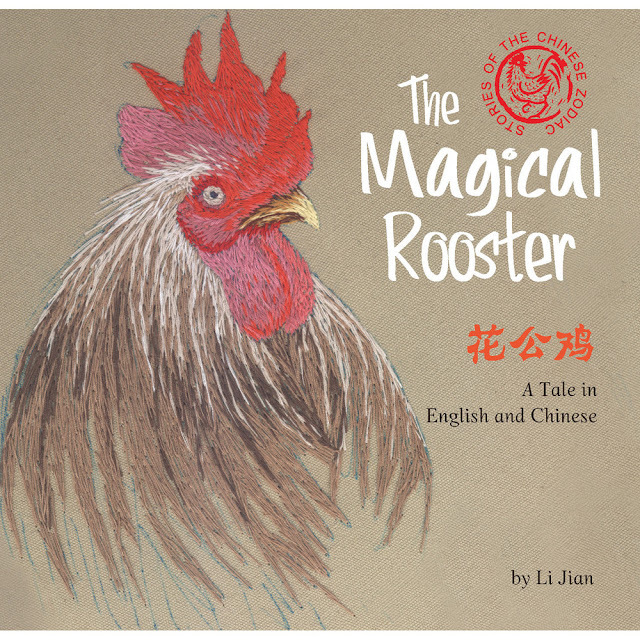 Our other book about the rooster is The Magical Rooster by Li Jian. This is the tale of Tang Yun and his mother. His mother made the most beautiful hand embroideries. When the time came for Tang to take the imperial exam he had to travel the long distance to the Capital City. His mother embroidered him a rooster on a special outfit for his journey. She insisted he not take it off during his journey. The journey was long and difficult and had many challenges. Tang worried he would not make it the Capital City in time for the exam and then the rooster came off his back and came alive and large enough for the exhausted Tang to ride on it. Tang showed his bravery when a fox tried to attack the rooster. Together they were able to fight it off and get to the Capital City in time for the exam. Tang did well on the exam and was to be an official in a local county. This meant Tang could not see his mother. One day the rooster disappeared and Tang wondered what happened to it. Then the rooster appeared with Tang's mother on its back. Tang and his mother were united again and lived in Tang's house. This tale is a lovely tale about the importance of rooster and family in China. The culture of ancient China comes alive with Tang's journey. It is such a wonderful and sweet tale. 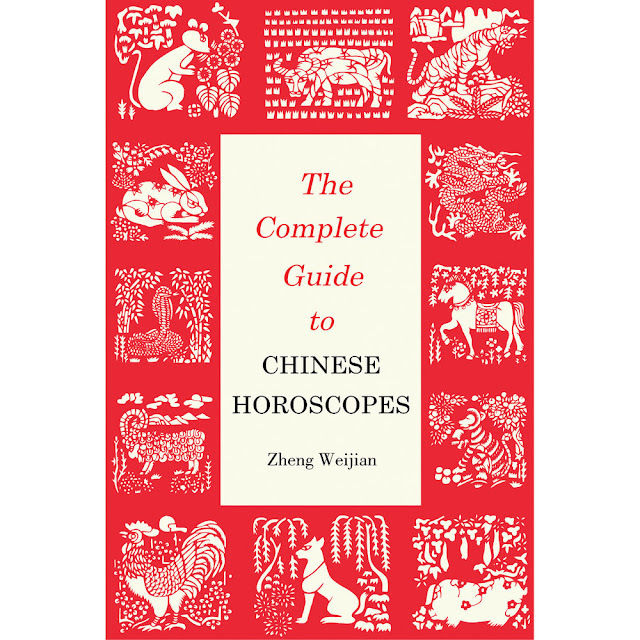 To learn even more about the Chinese zodiac I used The Complete Guide to Chinese Horoscopes by Zheng Weijian. This book shares a bit of the history and how the Chinese horoscopes are used. Then there is a chapter about each animal in the zodiac and each chapter includes sections on life path, personality, profession, love and marriage, the luck of wealth, overall fortunes in different animal years, overall fortunes of each of the animal born in different months, days and hours by the lunar calendar. In the love and marriage section the book looks at the male and female of the animal with the opposite gender of each other animal and how the match will be. Since the new year will be the year of the rooster here is a bit about the rooster. Legend has it that the rooster is a descendant of the mythical creature, the phoenix. The rooster represents great socialness. The traits of people born in the year of the rooster are hardworking, generous, enthusiastic and such. They also like to win over all others, are responsible and have a strong sense of vanity and overindulgence in pleasure. This book is very interesting and a great way to explore the Chinese horoscopes and see how it works for you and your friends and family. To go with the year of the rooster I made some rooster new year's cards. I shared my paper cut one on Sunday with a beautiful book about the art of paper cutting for celebrations including the Chinese New Year and the Chinese zodiac. I also used a large rubber stamp that I had to make some cards. Unfortunately the roosters crown had fallen off the stamp so I had to draw my own in with liquid pearls. One card is stamped with red ink. The next is heat embossed with glitter red embossing powder and the third is my paper cutting. 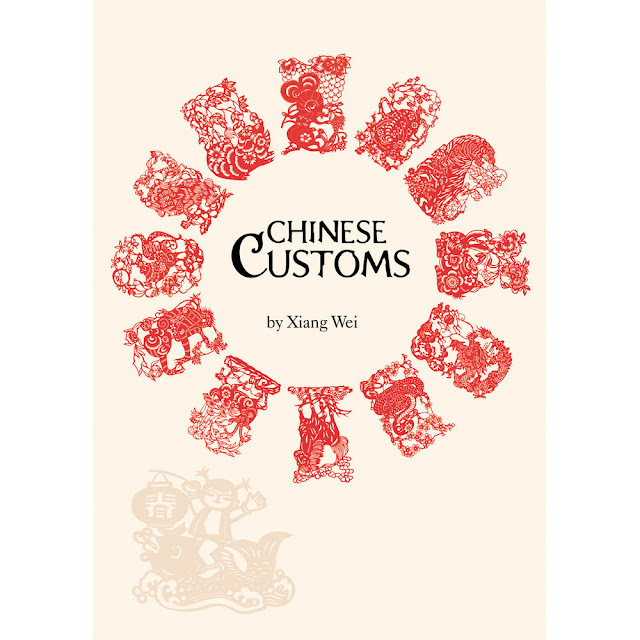 To learn more about how the new year is celebrated in China I looked at Chinese Customs by Xiang Wei. The Chinese New Year or the Spring Festival is the largest and most important festival in China. An interesting fact I learned in this book is that in 1949 the Gregorian calendar was adopted by the People's Republic of China and January 1st was designated as New Year's Day but is considered the solar new year. The Spring Festival celebrates the traditional new year or the lunar new year. The first three days of the lunar calendar are legal holidays in China and are set aside for the celebrations which often include fireworks, family reunions, scrolls and dragon dances. The celebrations actually begin on the last day of the lunar calendar and last until the fifteenth day of the first month which is known as the lantern festival. Traditionally the younger members of a family are to show respect to their elders and wishing them good luck and a long life and in return the younger member will receive a red envelope with money in it. Traditionally the second and third day married daughters are to visit their childhood homes with their families. Often fruits, nuts and treats are brought and shared with neighbors to show affection. This is also a good time to visit distant relatives and friends. The fifth day is to welcome the God of Fortune. The sixth day is set aside for saying good riddance to poverty. There is also traditional food to be eaten during the Spring Festival which has symbolic meanings to the Chinese. Dumplings and New Year Cake symbolize hope for a better and more abundant new year. Chinese Customs has many details of the various festivals, zodiac, seasonal division points, culinary delights, customs and talismans of China. It is a wonderful book to learn a bit about the customs both now and traditionally. 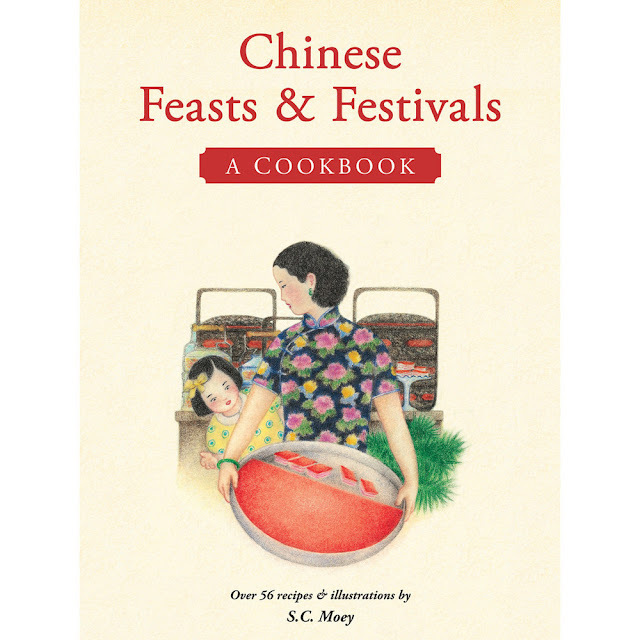 To explore the food aspect of the Spring Festival or the Chinese New Year we take a look at Chinese Feasts & Festivals: A Cookbook by S.C. Moey. This book has beautiful illustrations throughout it to show the celebrations of the various festivals and feasts. It starts with recipes for a Chinese feast including poultry, meat, seafood, vegetable, rice, soups, noodles, and dessert recipes. Then it goes into the specific festivals with recipes of food often eaten during them. It also provides a bit of information about the festival itself. Chinese New Year preparations begin immediately after the winter solstice. It begins with spring cleaning and cooking. During the new year festival people are always giving and receiving gifts. Dried meats and sausages, ducks, shark fin, abalone, fish maw and oysters, fruit, liquor and homemade cakes and pastries are considered seasonal delicacies. Traditional live poultry would be a common gift but that has gone out of style due to the difficulties of gifting it now. The festivities begin with a new year's eve family reunion dinner. Everyone is present except married daughters will be spending it at their in-laws. There is an abundance of food each prepared to attract wealth, luck and success. Men often play mahjong. Some people will visit night fairs in search of bargains. Children often entertain themselves with fireworks, new toys or television. The actual hour of the new year is determined by the Chinese almanac. It can be any time between midnight and two in the morning. After giving much information about how the festival is celebrated in China there are also recipes for Dried Sweet Barbecued Pork, New Year's Cakes, Festive Arrowhead Stir-Fry, Yusheng Sashimi Salad, and Traditional Chinese Jiaozi (dumplings). We have not tried any of the recipes from this book, but I plan to very soon since we are also exploring China this month with a look at tea there. I will share my thoughts on the recipes when I share about our Chinese tea party!! I can say that the illustrations and information in this book is amazing though!! That is our look at the year of the rooster. I hope you will check out the books we have shared and feel free to check out our links to take you to past crafts and celebrations!! 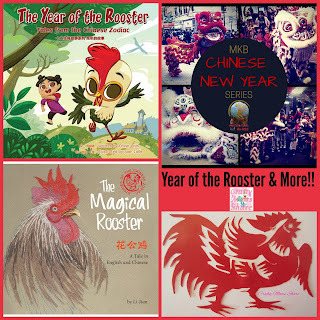 This post is part of the Multicultural Kid Blogs Chinese New Year Blog Hop. Please check out the other posts in this blog hop listed below! !